Represents the new generation of bandura instrumentalists. He studied under Prof. Serhiy Bashtan at the Kyiv Conservatory (now the National Academy of Music of Ukraine), graduating in 1993 as a solo bandura performer, exhibiting outstanding artistic and technical potential. 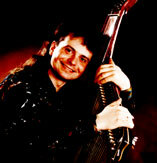 Since then, he has completed a master’s degree and has been teaching bandura at the Conservatory since 1995. Since 1993, he has been an Associate Artist of the International Menuhin Association. The varied repertoire of this gifted musician consists of his own compositions, original works, classical transcriptions, and Ukrainian folk themes; however, improvisational music is what interests him most. He has performed with great success throughout Ukraine, Europe and Australia participating in concerts and international music festivals. In music competitions in Ukraine and abroad, he has garnered the highest awards, and was the grand prize winner of the First Hnat Khotkevych International Bandurist Competition held in Kyiv in 1993. He has been recognized by such internationally renowned musicians as John Williams, Andreas Vollenwieder and Al Di Meola (2003 recordings). He has also six recordings which have been released and new materials which are being mastered. Mr. Hrynkiv’s interests are quite varied - from perfecting the sound quality and structure of the concert bandura, to seeking new possibilities of expression. 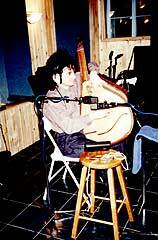 He designed and built his own instrument and has included the continued development of bandura design as one of the main focuses of the Golden Chord Fund, a non-profit organization he founded and heads.